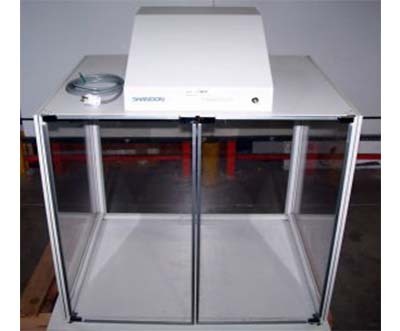 The Thermo Shandon Hyperclean 2 fume containment hood (cat# 8000361) may be used for enclosing large benchtop equipment. It has full-height front doors that provide easy access to equipment. Sides may be removed and replaced for easy access. Sides and front are made from clear acrylic, which is impervious to most chemicals. Filters are replaced easily without tools.